The increase in speed performance is based on many Dynamsoft image set tests. Scanning of 1D and 2D barcodes in a four-core CPU environment were used to conduct testing and to produce an average speed. The increase in speed performance is based on many Dynamsoft image set tests. Scanning of 1D and 2D barcodes in a four-core CPU environment were used to conduct testing and to produce an average speed. The increased performance in this major update comes from many algorithm improvements. New algorithms were added for barcode localization on photo images and for text filtering on document images. Also, the algorithms for barcode decoding were revamped. 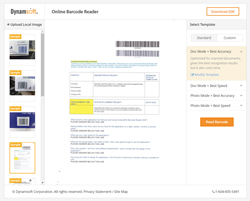 For the new custom barcode reading template, developers can use it to create flexible barcode scanning templates for specific use cases. There are currently two pre-set templates: Doc Mode and Photo Mode. These optimized templates ensure better performance depending on your scan scenario. There is also an option to create custom templates to specify parameters including barcode format, source image type, max barcode count, localization mode, and more. Dynamsoft's Barcode Reader SDK 6.0 is provided with rich code samples. It is backed by technical support channels that include an online knowledge base, email, chat, phone and more. It is now available for download from the Dynamsoft website. Developers can also use a live online demo and download trial versions from the website product page. Dynamsoft Corp. provides enterprise-class TWAIN™ software development kits (SDK), a Barcode Reader SDK, and a Camera SDK to help developers meet document imaging requirements for developing web or desktop document management applications. The company also provides enterprise-grade version control software to help developers manage developer teams and projects. The imaging SDKs help today’s businesses seeking to migrate from wasteful paper-based workflows to efficient electronic document and records management. Dynamsoft is an associate member of the TWAIN Working Group that develops TWAIN standards. Thousands of customers use Dynamsoft's solutions. Customers include 3M®; Apple®; EMC®; FUJIFILM Medical Systems U.S.A., Inc.; Fujitsu®; GE®; H&R Block®; HP®; IBM®, Intel®; Infosys®; Lockheed Martin®; Olympus®; Philips®; PricewaterhouseCoopers®; Samsung®; Siemens®; Symantec®; Unisys®; Verizon®; and more. The company was founded in 2003. More information is available at http://www.dynamsoft.com.